The Transformers Animated line of Transformers toys remains to be one of the more popular ones among my collector friends. And I suppose it can't be helped - there's something nicely appealing about the overall aesthetic of the figures that makes them so appealing. Plus there's the fact that so many memorable characters from the G1 era have made for some very interesting Animated adaptations. But the first season of the cartoon didn't quite win me over despite all the positive feedback about the series in the fan community. It wasn't entirely bad, but at the same time it seemed to lack a little something - and it's tricky for me to define precisely what that is. But clearly the folks behind the show wanted to take significant steps in this second season to change things up a bit, and I definitely appreciated a lot of the changes. If anything, this season made sure to tie itself more to the G1 series even though it's not really meant to do so from a continuity perspective. Thus it became quite the subtle play at things to keep the story interesting for both new Transformers fans while subtly pandering to the older generation as well. 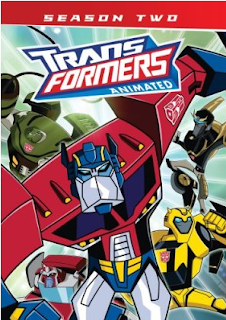 Synopsis: Transformers Animated is an animated TV series based on the original Transformers line but not necessarily meant to directly connect to prior cartoons or the movie franchise. It was produced by Cartoon Network with Matt Youngberg as supervising director. At the end of the first season, Megatron (Corey Button) was no longer just an evil head trying to take over the world but now a full Decepticon again. This second season has the Decepticons back in hiding just as the Autobot Elite Guard, consisting of Ultra Magnus (Jeff Glen Bennett), Sentinel Prime (Townsend Coleman) and Jazz (Phil LaMarr), arrive on Earth to retrieve the Allspark. But of course now the Allspark is broken into fragments that have scattered all over and thus the Autobots now need to try and retrieve the pieces. There season had a series of side-plots that were eventually fleshed out as things progressed. One was the disappearance of Sari's (Tara Strong) father, Professor Isaac Sumdac (Tom Kenny), who had been kidnapped by Megatron. Thus her father's company is eventually siezed by a rival and Sari is left to make do with just living with the Autobots. 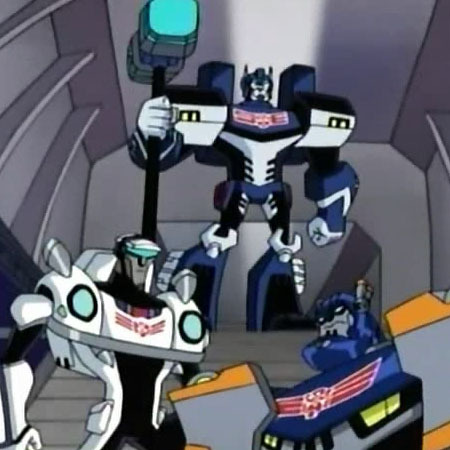 Another involves Starscream's (Tom Kenny) own aspirations for power on his own. And lastly we have the Decepticon plan to build a space bridge back to Cybertron. Given the scattering of Allspark fragments all over the place, the season brings in a new of new Transformers that supposedly formed almost spontaneous because of Allspark exposure. 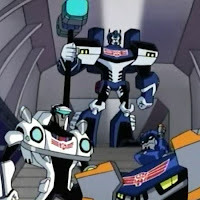 Plus with the arrival of the Elite Guard, we also learn more about Cybertron and a few of the Transformers "back home." Notable debuts in this season include Wreck-Gar ("Weird Al" Yankovich), somewhat Constructicons Scrapper (Tom Kenny) and Mixmaster (Jeff Glen Bennett), Bumblebee clone Wasp (Tom Kenny) and the always awesome Shockwave (Corey Button). There are a few more interesting ones, but I don't want to spoil the season for you just yet. I think it significantly helped this season to have an actual villain that did more than just complain, as was Megatron's lot in life in the first season. While Transformers are in fact robots in disguise, the first seaason feature way too many human villains being used as pawns of Megatron-head's plans. This time around we had Megatron taking more active steps to further his plans while at the same time managing to remain very secretive and hidden from Autobot observation. There was a slight decrease in human activity in this season or perhaps just an increase in Transformer involvement to help dilute things, as it were. And the goal of introducing more characters this season really did a lot to keep the show interesting while at the same time tickling the sensibilities of fans of the original 1984 cartoon. And given a few of them feature the original voice actors, it does provide for a little insider fun as the show continued on. However there were a few narrative issues that I had with the series, but I suppose that's to be expected from a show that was primarily geared towards younger audiences. It's never an easy balance to strile, especially for an animated series pretty much geared towards selling toys more than most other goals. But I guess your only balance point there is the fact that a number of the characters that had been introduced in this season were never given toy counterparts in the Transformers Animated line, which was a bit quirky. Transformers Animated is still a fun romp that was made more entertaining this season with new blood using familiar voice talents. And the overall escalation of the action does show promise - or at least gives me enough hope to want to finish the 3rd season soon enough.